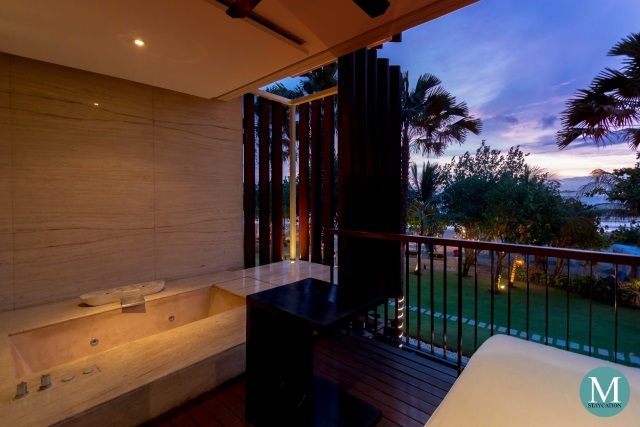 The Anantara Ocean Suite is one of the three suite categories of Anantara Seminyak Bali Resort. 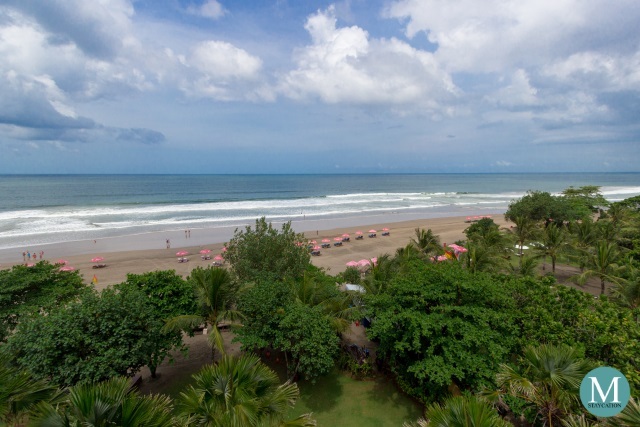 These suites are located on the higher floors of the hotel and are facing Seminyak Beach. 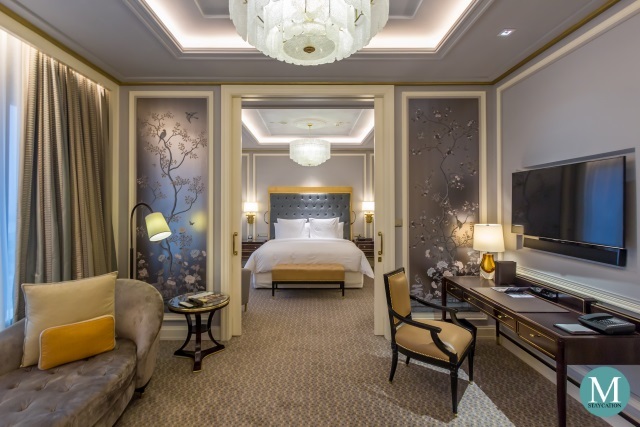 As the name suggests, the suite offers a sweeping view of the Indian Ocean. All the suites at Anantara Seminyak Bali Resort offer 80 square meters of living space, which are some of the most spacious accommodations in this famous holiday destination. 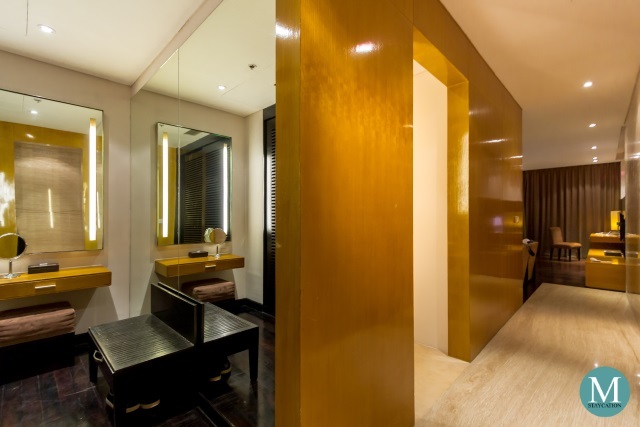 The suite has a separate walk-in closet, a spacious bathroom and an open living area, and a private veranda. Furniture pieces are mostly made of wood and other natural materials. The seating area features sofas with cushions covered with silk and luxurious rugs add contrast to the dark wood used as flooring. 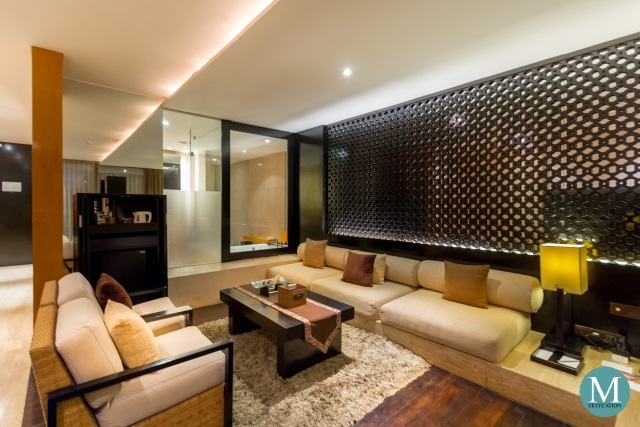 The wall is covered with wood paneling with Balinese-inspired carved motifs. 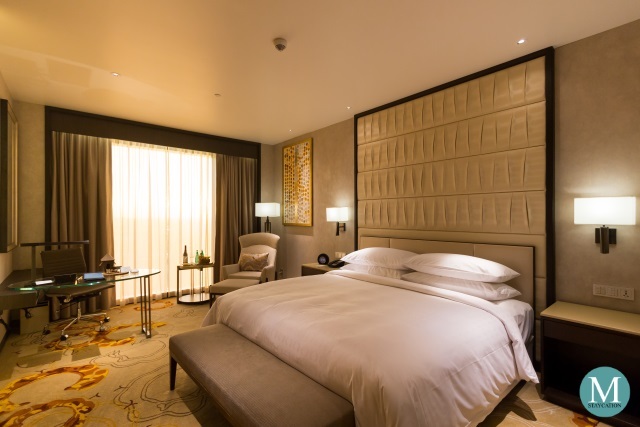 The suite is equipped with a flatscreen television with international satellite channels. It has a Boss home theater sound system. 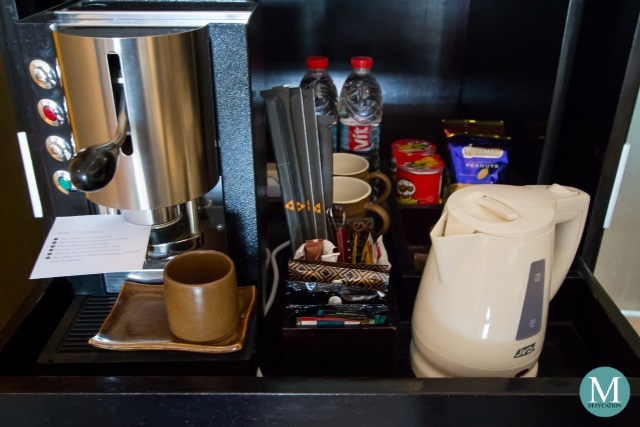 There is also a minibar, an espresso machine and a tea making facility. Complimentary Dilmah-branded teabags are also provided. The king-size bed was big enough for three persons, definitely one of the biggest hotel beds I have seen. The mattress was very comfortable too. It has the right balance of firmness to support your body weight and softness to adjust to the contours of your body. There is also an executive writing desk which you would most likely use for in-room dining. The sliding glass door leads to the suite's private veranda. 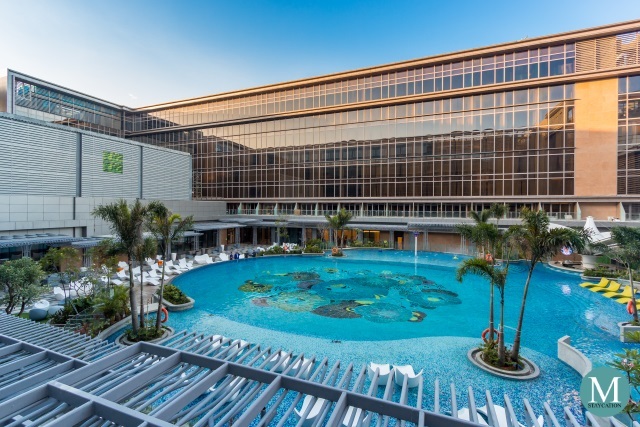 There is a spacious lounger on one side an a deep-soaking jacuzzi on the other. The veranda is facing towards the west making it well shaded in the morning and bathed with sunlight in the afternoon. The view, however, is consistently breathtaking at anytime of the day. 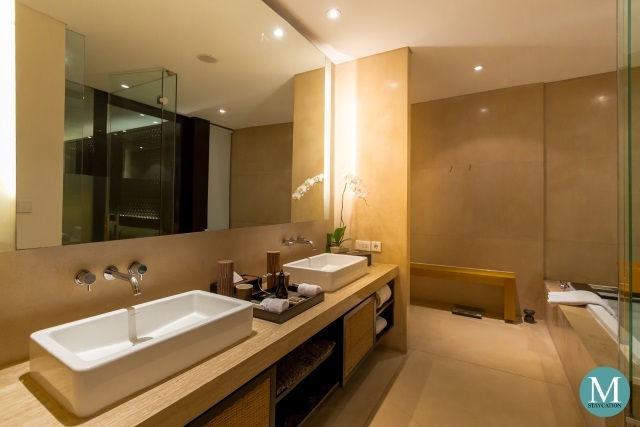 The en-suite bathroom is equally spacious with a separate bathtub and walk-in shower, double basin and a lavatory. The bathtub is big enough for two persons, perfect for couples on honeymoon. I rarely use the bathtub but this occasion was an exception. The walk-in shower was also spacious enough for two persons. The rainfall shower was very wide that it can cover the whole body of the person standing under it. 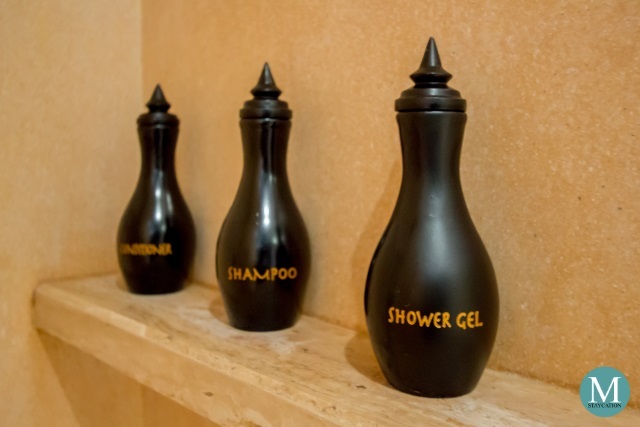 Shampoo, shower gel and conditioner were provided in refillable clay bottles. In summary, the highlights of my stay in the Anantara Ocean Suite are the bed, the bathtub and the ocean view. The bed was very comfortable plus the sound of the waves at night added to the relaxing sleep experience. I think I spent two hours in the bathtub just enjoying the warm bath while listening to traditional Balinese music. Finally, the view from my room was amazing.